The principal sports in Haiti is soccer. However, many Haitian play basketball, volley ball as well as many other sports. Up until today, the Summer Olympics have been held 27 times (6 editions in North America, 16 in Europe, 3 in Asia and 2 in Oceania). The Summer Olympic 2016 is unique for many reasons. Golf has been reinstated after a 112-year absence. The Rio 2016 games will be the first to feature Olympians born in the year 2000. The rule says, the Olympians must have been born before Jan. 1, 2003 with relaxation to certain games for health and safety reasons. A team of athletes (10 refugees) who were forced to flee their countries will compete under the Olympic flag. There are 7.5 million tickets, with prices ranging from $40 (for some swimming events) to almost $3000 (for the best seats at the opening ceremony). Organizers will prepare 60,000 meals per day to feed the athletes. Rio 2016 will appoint 70,000 volunteers. 'Taxistas' or Rio's taxi drivers were given opportunity to join a free English course. Total cost of Rio 2016 will mount up to €10.24 billion ((37.6 billion Brazilian Real) including €6.56 billion (24.1 billion Real) for the infrastructure of the city, € 1.77 billion (6.5 billion Real) for sports facilities and €1.91 billion (7 billion Real) for the operation and organization of the event. Fernando Rosado Spilki, a virologist and an expert in water quality was commissioned by the Associated Press to test conditions in all the water at Brazilian competition sites. Spilki is an expert on the subject from the Universidade Feevale in Brazil. In last July, he identified virus levels 1.7 million times more than which would be considered highly alarming in the U.S. or Europe. It is basically 'poop water' and the IOC does not care for that. Nobody can deny the facts that raw sewage regularly flows into many of Rio's Olympic venues every day and there is no dilution factor in the bay or lagoon where events will take place and within this polluted environment, the exposure is imminent and the chances of infection are very likely. Officials have already admitted that they would be able to treat maximum 65% of the sewage that flows into the bay, not their earlier target of 80%. Kristina Mena, on examining Spolki's report, has predicted that if any athlete ingests just three teaspoons of water from the bay, will have a 99% chance of infection. Ms. Mena is an expert in risk management for waterborne viruses at the School of Public Health at the University of Texas. Coaches are advising sailors to keep their mouths closed and sanitize themselves once they come into contact with polluted water. Here is the Haitian runner Jeffrey Julmis during the first of the 110m hurdle semi-finals at the Olympic games in Rio. He toke a dive but despite being hampered, he managed to finish in a time of 25.56, nearly 12 seconds behind the second-last place runner. In his first series, Jeffrey Julmis finished in 13.66 seconds and ranked 3rd on 9 runners. 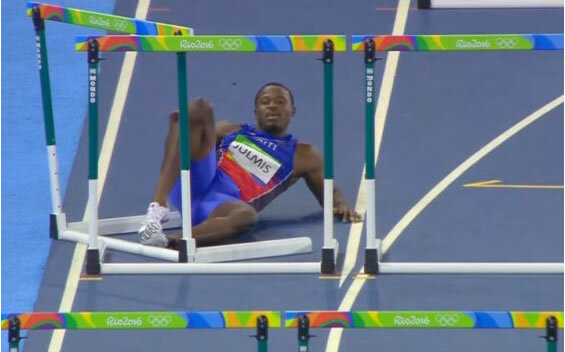 Haitian hurdler Jeffrey Julmis fell down after hitting a hurdle in the 110 meter hurdles semi-finals. His falling drew massive cheers from the crowd at the Estadio Olimpico on August 16. Julmis mistimed the first obstacle on the course and jumped straight into the first hurdle during the first of the 110 meter hurdles semi-finals and tumbled head over feet into the second one while taking the first hurdle with him all the way to the second hurdle. But, in true Olympic spirit, he got up again to finish the race to huge cheers from the crowd. Took a deep breath, composed himself and cleared the final eight hurdles in a time of 25.56 seconds, nearly 13 seconds behind race winner Orlando Ortega of Spain (13.32 seconds) and 12 seconds behind the second-last place getter Ronnie Ash of USA (13.36 seconds). Yordan O'Farrill of Cuba came last in the round with 13.70 seconds time. He was later declared disqualified, but no one's run was more memorable than Julmis in Lane 9 who ended up himself doing a somersault, landing close to the second hurdle. The story behind the Olympic medals goes all the way back to the ancient Olympics, when only the winner of an event would receive a crown of laurel leaves as his prize. Leaves of such crown were taken from a sacred grove, near the temple of Zeus, in Olympia. In 1896, the winners were awarded silver medals and a diploma in addition to the crown. In 1904, for the first time in the Olympic history, the tradition of awarding gold, silver and bronze medals began in St. Louis, Missouri, in the United States. 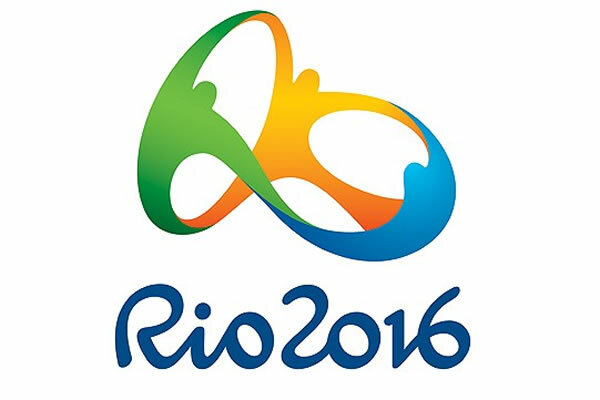 According to the Haitian Olympic Committee, 10 Haitian athletes are representing Haiti in Rio 2016 in Brazil from 5 to 21 August 2016. They are: Darrell Wesh (100 and 200 meters), Jeffrey Jilmus (110 meters hurdles), Mulern Jean (100 meters hurdles), Samyr Lain¨¦ (triple jump); Richardson Hitchins (Boxing); Josu¨¦ Deprez (Judo); Edouard Joseph (Weight Lifting); Asnage Castelly (Wrestling); Aniya Necol Louissaint (Taekwondo). Naomy Grand ¡(r)Pierre is a former Whitefield Academy swimmer; her participation has been accepted in the Aquatic Sports by the International Swimming Federation (FINA). Haiti is what is known as a ¡°universality place¡±; the nation can send one male and one female athlete to the world championships. Since Haiti does not have any swimmer to match the Olympic qualifying speeds, Naomy was approached by Haitian authority if she would like to join its national team for this summer¡¯s Olympics in Rio de Janeiro. Her representation has been accepted under the rule of Universality. She is a current resident of Atlanta, a Major in Economics and International Studies, a regular participator in swimming, track and soccer in high school. So far, Haiti had sent the maximum number of participants (13) in the 1976 Montreal Olympic-- 10 in Athletics events and 3 in Boxing. The threat of the Zika virus is absolutely real in Brazil and it has reached in Rio de Janeiro. There it is flourishing beyond expectation. In last January, the declaration of Rio as a "safe environment" by the International Olympic Committee was a plain speculation based upon a declaration by the Brazil's Ministry of Health that described "Zika as a notifiable disease". The declaration was not supported by any actual data, because then the counting of cases was not started. However, when the data became available, it showed Rio de Janeiro's suspected Zika cases (about 26,000) are one of the highest (fourth, with 157 cases per 100,000) of any state in Brazil. After years of money being dumped into the games, IOC felt it is not possible to delay or move the Rio Games because of Zika. With an estimated 500,000 foreign tourists who will flock into Rio for the Games, there are enough chances that Brazil's Zika will spread globally. The decision to continue Summer Olympics in Rio is purely a financial decision, not a logical one.